Orb / SFBC. Used - Very Good. Very Good condition. Very Good dust jacket. Orb / SFBC. Hardcover. 1607514907 Like New Condition. . Fine. Orb / SFBC. Hardcover. 1607514907 New Condition. . New. Gregg Press. Hardcover. 0839824505 Some wear. Some stains. . Good. 1979-01-01. Pocket Books. MASS MARKET PAPERBACK. 0671670557 New Condition. . New. Pocket Books. MASS MARKET PAPERBACK. 0671804901 New Condition. . New. Orb Books. PAPERBACK. 0765316765 New Condition. . New. Orb / SFBC, 2008-01-01. Hardcover. Used:Good. Orb Books, 2008. Paperback. New. 8.5 x 5.5 cm. Pocket Books. MASS MARKET PAPERBACK. 0671670557 Like New Condition. . Fine. Orb Books. PAPERBACK. 0765316765 Like New Condition. . Fine. Pocket Books. MASS MARKET PAPERBACK. 0671804901 Like New Condition. . Fine. Pocket Books. Used - Acceptable. Shows definite wear, and perhaps considerable marking on inside. Pocket Books. Used - Good. Shows some signs of wear, and may have some markings on the inside. NY: Pocket Books, 1977 Nice condition.. Fourth Printing. mass_market. Very Good/No Jacket. Orb Books, 2008-09-02. Paperback. Used:Good. Orb Books. PAPERBACK. 0765316765 Special order direct from the distributor . New. Orb Books. PAPERBACK. 0765316765 Brand New! Fresh from the Publisher! . New. New York: Pocket Books, 1976. 1st Pocket Edition. Very good paperback copy; edges somewhat slightly dust-dulled and nicked. Remains particularly well-preserved overall; tight, bright, clean and strong. 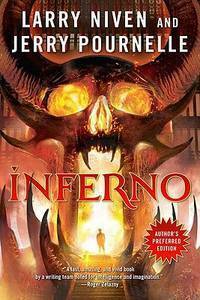 ; 8vo 8"" - 9"" tall; 237 pages; Description: 237 p. ; 21 cm.Subject: Hell -- Fiction. Summary: After falling from the eighth story of a hotel during a science fiction convention, writer Allen Carpentier wakes to find himself at the Vestibule of Hell. His journey thorugh Hell reveals new, puzzling, and outlandish methods of sin recast for the twentieth century..
Tor Science Fiction, 4/4/2017. Later Edition. Mass Market (i.e. 4 by 7 inch softcover). Volume condition: New (Condition varies from Fine to Near Fine. Please inquire as to specific condition) / Jacket Condition: N/A (volume is softcover). New York: Pocket Books, Inc., 1976 Faint corner rubbing; slight crease to the front joint bottom. Text is clean. 237 pages. New York: Pocket Books, Inc., 1977 Light rubbing to the extremities. Text is clean. 237 pages. Tor Science Fiction. MASS MARKET PAPERBACK. 0765355949 *LIKE NEW* Ships Same Day or Next! . Fine. Tor Science Fiction. MASS MARKET PAPERBACK. 0765355949 *BRAND NEW* Ships Same Day or Next! . New. Orb Books, 2008-09-02. Paperback. Good. Pocket Books (Mm), 1988-08. Paperback. Good. Orb / SFBC. Hardcover. 1607514907 Item in good condition. Textbooks may not include supplemental items i.e. CDs, access codes etc... . Good. 2008. Tor Science Fiction. Used - Good. Ships from Reno, NV. Former Library book. Shows some signs of wear, and may have some markings on the inside. 100% Money Back Guarantee. Shipped to over one million happy customers. Your purchase benefits world literacy! Pocket. Used - Good. Shows some signs of wear, and may have some markings on the inside. Pocket Books (Mm). Used - Very Good. Great condition for a used book! Minimal wear. Pocket. Used - Very Good. Great condition for a used book! Minimal wear. Orb Books. Used - Very Good. Former Library book. Great condition for a used book! Minimal wear. Pocket. Used - Good. Ships from Reno, NV. Shows some signs of wear, and may have some markings on the inside. 100% Money Back Guarantee. Shipped to over one million happy customers. Your purchase benefits world literacy! Pocket. Used - Acceptable. Shows definite wear, and perhaps considerable marking on inside. Orb Books. Used - Good. Shows some signs of wear, and may have some markings on the inside. Orb Books. Used - Good. Ships from Reno, NV. Former Library book. Shows some signs of wear, and may have some markings on the inside. 100% Money Back Guarantee. Shipped to over one million happy customers. Your purchase benefits world literacy!